The Splintered series has been one of my absolute FAVORITE series since I picked up book one way back in the day... Okay, so it wasn't that long ago. Still, if you ask me what my favorite series is, chances are I'll probably say "SPLINTERED AND OHMYGOD YOU NEED TO READ IT!" When I saw that A.G. Howard was releasing a companion to the series, I didn't think I could possibly contain my excitement. The day the book was released I checked the mail no less than three times and ran home to open the box when it finally came! I blew through it in near-record time and was... underwhelmed. Untamed is a collection of three novellas, two of which have been previously published. The Boy in the Web is essentially the story of Alyssa's parents. While it was entertaining, it wasn't my favorite. Let's be honest, you're either reading this for Jeb or Morpheus. Still, it was a nice look into the family of the fairy queen we've come to know and love. The second story, The Moth in the Mirror, told Jeb's side of the story through some key Splintered events. Although Jeb is not my favorite person for a few reasons, I actually really enjoyed this story a lot. I felt like I was able to get to know Jeb a little better and could even sympathize with him a little bit more. Six Impossible Things was the part of this collection I was most looking forward to! It begins with Alyssa as a very old woman getting ready to make her journey back to Wonderland and it was just a little bit odd for me. For one, Alyssa did not seem very much different from her much (much) younger self. I did get a little of the sense that she'd matured, but it felt like I was hearing from a 16 year old telling me about how old she was. It felt a little strange for her to suddenly be back in her "pure" 16 year old body again. Overall I thought this was a fun companion to the Splintered series! 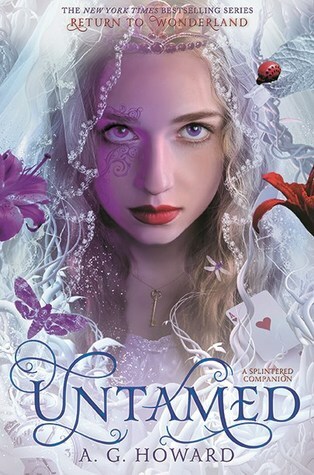 The cover is absolutely the MOST gorgeous of the entire series, which is saying a lot because have you even seen Unhinged? ?Untamed did have some issues that I didn't expect to encounter, a little too much focus (for me, personally) on the children/grandchildren/etc. when I really just wanted to read about Alyssa and Jeb/Morpheus as couples. Still, this was an enjoyable collection of stories that I'd recommend to any fan of the Splintered series!